Seventeen Dorset ewes moved into a brand-new space at the Cummings School, just a week before five of them were due to lamb. Overlooking the farm fields, Tufts’ new metal-sided sheep barn replaces a 70-year-old wooden enclosure that had become structurally unsound. The original barn was built around 1940, when the North Grafton campus was home to a farm colony for patients of a state psychiatric hospital. 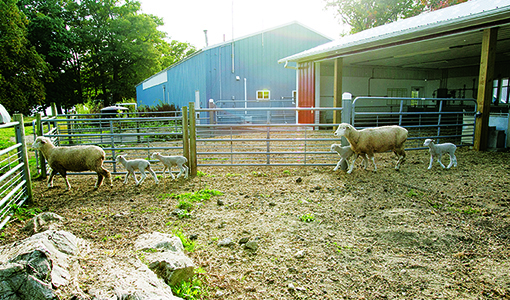 Completed in September, the $250,000 barn provides a better environment for the animals and for the veterinary students and farm workers who care for them. Some 200 veterinary students work with Tufts’ flock of sheep during their first- and second-year clinical rotations. “Many of our students have never worked with livestock before,” says Tufts herdsman Scott Brundage, who teaches students everything from basic sheep handling to performing vaccinations, dewormings and ultrasounds for pregnancy checks. The new barn doesn’t have interior support posts, creating better sight lines for student learning and more flexibility for configuring sheep pens and cleaning, notes Joseph Chilton Jr., the director of facilities on Tufts’ Grafton campus. Unlike the old barn, the new enclosure is fully insulated, eliminating the large temperature swings that were uncomfortable for humans and animals. A state-of-the-art translucent curtain wall provides protection from the sun and wind. Spanning the west-facing wall, the curtain allows more daylight and fresh air into the space, and staff can program the curtain to rise or fall according to the temperature.